The kids are “pirates” where pirate has been redefined to mean believing in sharing and friendship, I guess. Disney’s Captain Hook, Smee, and a couple of new pirates are also on hand, always trying to steal their stuff. But not murder them. Because this show doesn’t even do justice to the Disney version of Peter Pan. This episode from the first season is split into two 12-minute pieces which still go on too long. In the first, it’s “Winter Treasure Day” on Pirate Island, and someone has been by in the night to drop off a decorated tree and presents. Of course it was… Peter Pan? Sure, whatever. Disney’s Hook and company steal the presents from the kids to have their own Winter Treasure Day celebration. The kids chase the pirates across a snow-covered Never Land. I should talk about the doubloons thing. Every time the group “solves a pirate problem” (i.e., overcomes any obstacle, no matter how simple or trivial) the kid gets gold doubloons that appear out of nowhere. 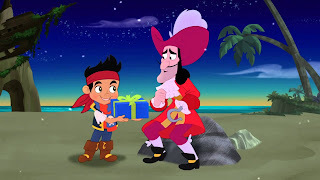 At the end of the episode, the kids ask you to count with them, and all the coins go into your “team treasure chest.” But they don’t ask the child viewer to suggest solutions or anything through most of the episode. It’s as though the writers are stuck between two different types of show. Anyway, once the kid pirates catch up with the adult pirates, they decide NOT to take their stuff back, but to wish them a Happy Winter Treasure Day and use pixie dust to go home. The adult crew have remorse for ruining the kids’ holiday and convince Disney's Hook to return all the stuff. And everyone has a party. In the second half, the adult crew con the kids into sharing the gifts received in the first half (ice skates, sled, snowboard) to help find a special “Never Land Snow Day Treasure.” In this show, Never Land seems to be a very boring video game world where money comes out of thin air and treasures spawn for certain timed events. In the end, after the kids save Disney’s Captain Hook over and over, he agrees reluctantly to share the treasure. Then his half melts because he doesn’t put it in a cooler. This is just a half-episode, and it’s not very holiday-themed, but it’s snow-themed and aired in December, so we watched it. A penguin friend helped the kids get some fire rubies to help their sick parrot. That’s all I have to say about it. Okay, it seems that the show may have gotten a little better as it went. This season three episode features a better opening sequence, better animation, and better music, and it scrapped the formulaic nature of the others. No more stupid doubloons to count! This is not a winter episode, but it aired in December and the Christmas Carol connection makes this a Christmas episode. One of the kids has a treasure he wants to keep all to himself, so Jake tells the story of Captain Scrooge to teach us all to share. Again. Seriously, I think sharing was the moral of every one of these episodes. In the story sequence, Disney’s Hook stands in for Scrooge as a mean captain who won’t share his treasure or let his crew go to “The Great Pirate Feast.” Captain Scrooge is visited first by his mother, who is not a ghost, but who apparently has the power to summon a ghost to teach her son to be polite. Only one ghost serves all three purposes, but the secondary pirates do get a trio of pleasant little ditties about the meaning of past, present, and future. Captain Scrooge has always been a selfish jerk, but apparently he decides that he doesn’t like that it drives his crew away, so he brings them to the feast after all and even makes up with a lady pirate he knew as a child. Back on Never Land, the kid pirate decides to share his treasure, because that’s the true pirate way or something. This last episode had a few redeeming qualities, but overall I'm sorry for you if your kid’s crummy taste subjects you to this one.